In my October 1 post I wrote about my plan to use Print Codes at a conference that was to be held the first weekend of December in Dallas. I was a speaker at Catholic Action Summit 2018, where the keynoter was Cardinal Raymond Burke. Here's how I handled book sales—quite differently from last year. Last year I schlepped boxes of paperbacks to the conference. It wasn't pleasant. I had to pay $25 per box (after the first one) to Southwest Airlines. Once I retrieved the boxes at baggage claim in Dallas, I had to figure out how to get them first to the hotel and then, the next morning, to the convention center, which was beyond easy schlepping distance from the hotel. When the conference concluded, I had leftover books, which meant I had to schlep in reverse. I decided to try a different tack this year. I wouldn't sell paperbacks. I'd sell ebooks instead. As reported on October 1, I printed business cards that had book covers on one side and instructions on how to redeem one-use download codes on the other. Downloading was made possible through Book Funnel's Print Code process. For each of eight titles I took anywhere from 75 to 125 cards, each one with a unique nine-letter code on the reverse. The cards were light and took up little room in my suitcase. I also took one sample copy of each book, so prospective customers could flip through the pages while deciding whether to get the ebook version. To advertise my wares I made a six-foot-tall retractable banner at Vista Print. This was an experiment. I figured that many in this audience wouldn't be ebook readers. It would be a mainly older audience, and many would imagine, falsely, that they would have to own a Kindle to read ebooks. I wanted to disabuse them of that notion, so my banner noted—in big letters—that my ebooks could be used on any device and with any operating system. Fortunately, I was able to effect a three-foot space between my table and the next. I put the banner there. If the tables had been cheek by jowl, I'd have had to put the banner in front of my table. That would have obscured three of its eight feet. Thinking I was going to have to do that, I didn't order a second banner because using two banners would have eaten up six of the eight feet, leaving me just a peek-a-boo hole through which to converse with customers. If I had arranged for a second banner, it would have highlighted three or four of the books, the ones I thought most likely to sell. The banner would have featured the books' covers plus a few promotional words about each. Next year, for the same conference, I likely will try the second banner. Aside from the sample books, on my table I had a laptop continuously playing a PowerPoint presentation that consisted of ten slides. There was one slide for each of the eight books. 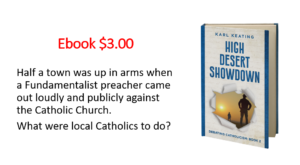 (Here is the slide for High Desert Showdown, the second book in the Debating Catholicism series.) Each slide had a few words about the book and the ebook price. The slide show also included two slides, placed equidistant apart, that touted the day's special offer: "buy any four ebooks and get the fifth one free." Quite a few buyers took advantage of the deal. Most of them bought the four cheapest books at $3.00 each and chose one of the more expensive books, at $5.00 or $6.00 each, as the freebie. Thus they spent $12.00 and got five books. They were happy, and I was happy. It cost me nothing to throw in the fifth book, beyond the few pennies it took to print an extra Print Code card for it. As I expected, I lost sales in not having paperbacks to sell. Some visitors to my table said they only read printed books. Others said they were open to reading digital books but didn't know how. On the other hand, the ebooks were a lot cheaper than paperbacks would have been. Many buyers spent as much as they likely would have on one or two paperbacks but got several ebooks. In terms of marketing, this conference was an experiment. I sold more books than any of the other speakers, I'm quite sure, but I know I lost some sales by having only ebooks. I hope to figure out how to appeal to the full range of buyers without having to do much schlepping. The next time I speak at a conference, I probably will take one or two boxes of paperbacks but still will push the ebooks, since I'll have many more Print Code cards than physical books.